Last month the Kate Takes 5 household reviewed the 3D DVD versions of 'Cats and Dogs' and 'Legend of the Guardians' for Warner Brothers, both of which received a big thumbs up from all of us. This month we've been watching Yogi Bear and Dolphins Tale in 3D. 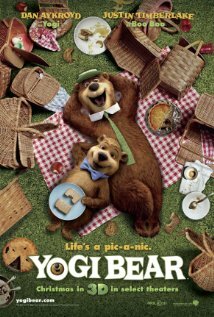 Yogi Bear of course needs no introduction - he may be 'smarter than the average bear' but clearly he aint that smart if his antics in this film are anything to go by! It's a fun story with typical Yogi and Boo-Boo adventures. We watched both the 3D and 2D (normal) versions and I have to say that, unlike 'Legend of the Guardians', I'm not sure this film really benefited from being in 3D. The kids enjoyed both versions but when they asked to put it on again they wanted the 2D version. The second movie - Dolphins Tale starring Morgan Freeman and Harry Connick Jr was much more impressive. Based on a true event it tells the story of a dolphin called Winter whose tail gets damaged in a crab trap. A shy and lonely boy helps rescue him and a friendship develops between them as he battles to help Winter swim again. It's a story of trial over adversity, of never giving up and of holding on to hope. Again we watched both versions of the film - the 2D version with all the kids and then a special Mum and daughter movie night for the 3D version (the thought of Harry Connick Jr. in 3D may have had something to do with that decision..). Kaya who is 7 absolutely loved the film and I must admit that I got sucked in too - the 3D effects were amazing in some scenes, especially in the aquarium sequences and certainly added to the 'experience'. Warner Brothers were also good enough to send us a special box of classic films to celebrate the 2012 Oscars. The fabulous Casablanca, An American in Paris, Gone with the Wind, and the more recent The Blind Side, along with two beheaded chocolate Oscars who didn't survive the trip. I wonder whether next year we'll get a one legged Angelina instead?